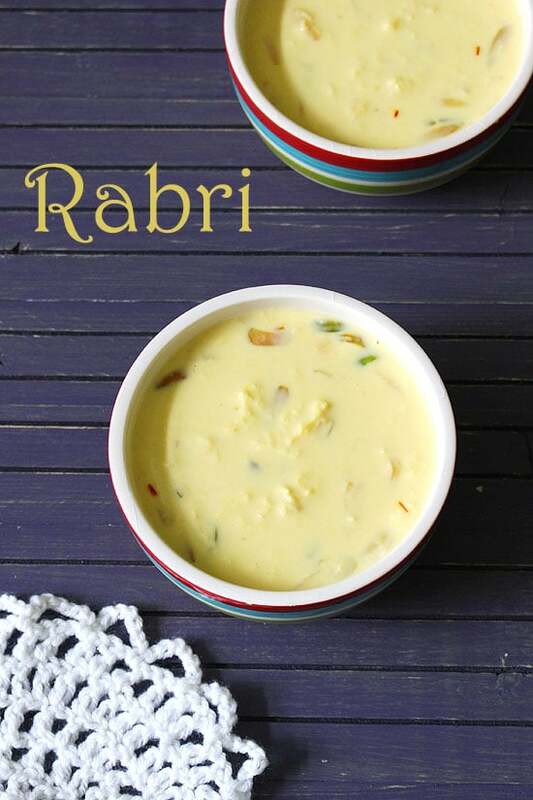 Rabdi or Rabri Recipe – A classic North Indian dessert recipe made with traditional method. This is made with very minimal ingredients but the taste is out of the world. The main ingredient is Milk (Whole milk or full fat milk) which is thickened slowly on low flame till it is very thick. During the simmering process, the cream layer is formed on top. That is collected by sticking to the sides of the pan. At the end that collected cream is added back to the thickened milk. This adds the long, rich lachha malai (layers of cream) in the rabri. And this is the BEST part of this dessert. Hence it is called lachhedar rabri malai too. Sugar is added for sweetness and saffron is added for some flavor. You can add cardamom powder or rose water for different flavor. 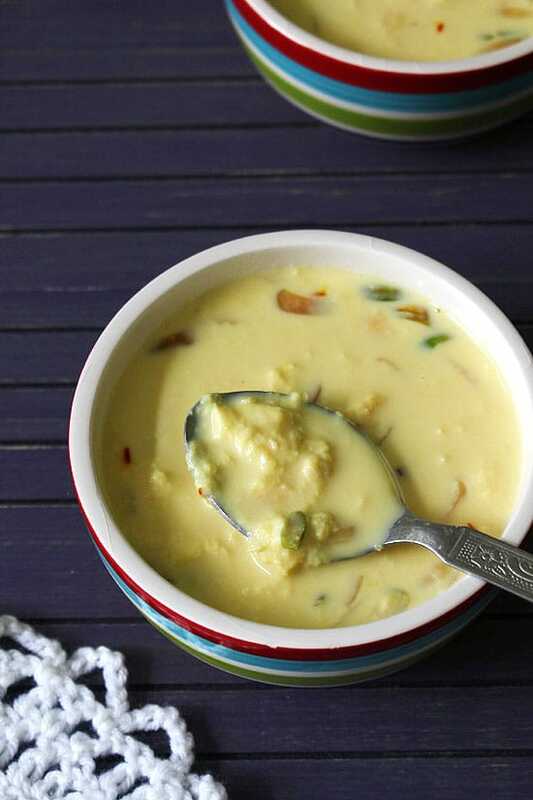 The similar ingredients are used in making Gujarati sweet Basundi. But the method is different and that results in very different texture. But the taste is little similar. While making basundi, we do not collect the cream rather we just mix in with the milk. So it creates the very little specs of cream in basundi unlike here we get long layers of cream. Making rabri at home is little time consuming, but not hard or complicated at all. This traditional method takes around 1.5 hours. There are many other instant methods you may find, but the true texture (lachhedar malai) will be missing in that. You can freeze this rabdi into kulfi moulds to get very creamy, rich malai kulfi. 1) Take boiling hot water in a bowl and add almonds and pistachios in it. Let it sit for 20 minutes. Then discard the water, peel the skin and chop/slice them. Keep it aside. 2) While nuts are soaking, take milk in a wide, heavy bottom pan or kadai and turn the heat on medium. NOTE: It is important to use the heavy bottom pan and also wide (not deep like saucepan). Wide pan helps milk to evaporate quickly and heavy bottom will prevent the milk from burning and scorching in the bottom of the pan. 3) Once the milk starts boiling, lower the heat to medium-low. It will start to form a thin layer of malai/cream. Now using spoon or spatula, collect that. 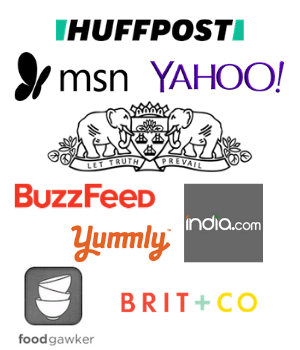 4) And stick it to the side of the pan. Within some time, it forms again and similarly stick to the sides. Continue doing the same till you reach ⅓ of its original quantity. 5) Few things to keep in mind: You have to stir it occasionally to make sure that it is not sticking to the bottom. But do not stir that often or quickly otherwise the cream layer will not form on top rather it will disintegrate into the milk (will end up with texture of basundi). 6) Left image is after 30 minutes, right image is after 50 minutes. 7) Now after 1 hour and 10 minutes, it reaches to ⅓ of original volume. 10) Mix and continue cooking and collecting the cream for another 5-7 minutes. Saffron will infuse its flavor and color. 11) Now start scraping the sides and add to the thickened milk. 12) Mix gently, we do not want to break the large layers (aka malai lachha) and simmer for 1-2 minutes. 13) Turn off the stove. Add sliced almonds and pistachios. 14) Mix and you can see this thick and lachhedar rabri. This can be served warm or chilled. Serving suggestion: You can enjoy rabri or rabdi on its own or serve with poori. This can be drizzled over few sweets like malpua, gulab jamun, jalebi, shahi tukda, falooda etc. This could be indulging but sure too good tasting. To blanch almonds and pistachio, add them into boiling hot water and let them sit for 20 minutes. Then discard the water, peel the skin and slice them. Take milk in a wide, heavy bottom pan on medium heat. Once it starts boiling lower the heat to medium-low. As soon as the cream layer is formed on top, collect with spatula and stick to the side of the pan. Keep collecting and sticking the cream layers till it reaches ⅓ of its original volume. It took me 1 hour and 10 minutes total. You have to stir it occasionally to make sure that it is not sticking to the bottom. But do not stir that often or quickly otherwise the cream layer will not form on top rather it will disintegrate into the milk. Once the milk is thick and ⅓ of the quantity, add sugar and saffron. Again cool and keep collecting the cream for 5-7 minutes. Then scrap off all the cream from the sides of the pan and gently mix, simmer for 2 minutes. Lastly add sliced nuts and turn off the stove. Simple process and delicious recipe….